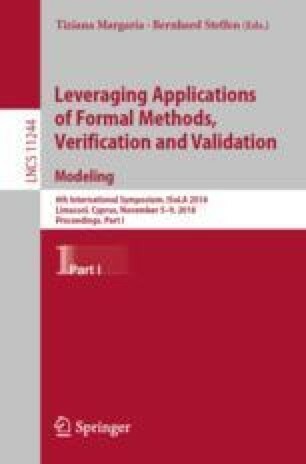 Formal verification of compiler correctness requires substantial effort. A particular challenge is lack of modularity and automation. Any change or update to the compiler can render existing proofs obsolete and cause considerable manual proof effort. We propose a framework for automatically proving the correctness of compilation rules based on simultaneous symbolic execution for the source and target language. The correctness of the whole system follows from the correctness of each compilation rule. To support a new source or target language it is sufficient to formalize that language in terms of symbolic execution, while the corresponding formalization of its counterpart can be re-used. The correctness of translation rules can be checked automatically. Our approach is based on a reduction of correctness assertions to formulas in a program logic capable of symbolic execution of abstract programs. We instantiate the framework for compilation from Java to LLVM IR and provide a symbolic execution system for a subset of LLVM IR. This work was funded by the Hessian LOEWE initiative within the Software-Factory 4.0 project. This appendix provides additional material for the reader, including a sketch of the integration of state merging techniques into our approach, an extended compilation example, and a proof of Theorem 1.
is sound in the sense of Definition 2. Translation rule mergeTransl (Fig. 7) merges two branches with identical program counters. 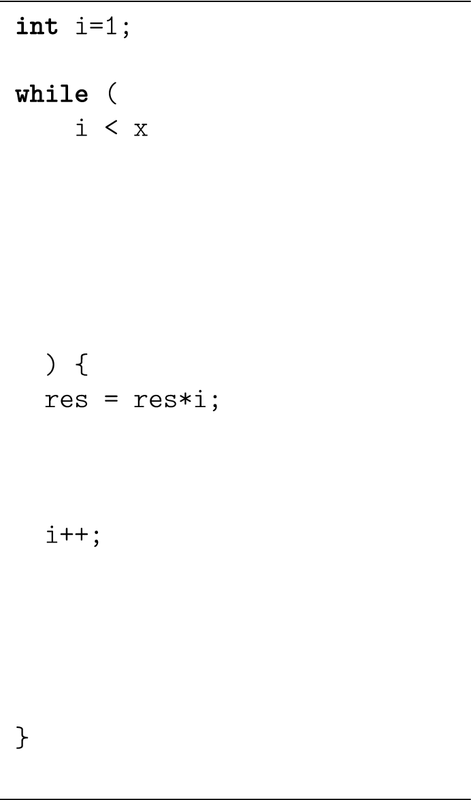 Without it, compiling programs with branching statements leads to duplicated code, for example, in rule ifElseTransl. The double horizontal line below the rule’s premise indicates its special status: it is the only rule with more than one conclusion. For constructing the merged symbolic store, there is more than one option . In the simplest case, we create a fully precise value summary by means of an if-then-else term. The program in Fig. 8 (p. x) computes the factorial of variable x, contained in variable res after termination. Figure 12 shows the SET of the dual SE states corresponding to the translation of the Java to LLVM IR code. Constructing the tree works by first symbolically executing the Java program. The Java SET has the same structure, without the LLVM IR parts and observable variables sets. In the second phase, we apply translation rules from the leaves to the root, obtaining the dual SE states. 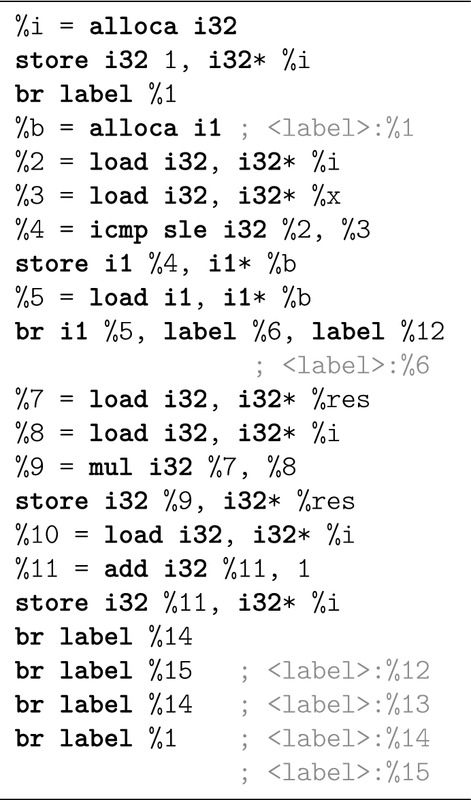 The root of the tree contains the compiled LLVM IR program \(q_ result \) depicted in Fig. 9 (with dropped loop scopes). The tree is slightly simplified: we sometimes abbreviate programs with “\(\dots \)” and combine several translation rules into one, for example, in the translation of Java’s Open image in new window , which in the course of SE would be simplified to SSA form first. Two subtrees have been factored out for better readability (Figures 10 and 11). The example also shows an artifact occurring due to our rule-based compilation: The basic block with label Open image in new window is never reached since it is not targeted by jumps, and the block before jumps outside the loop (this is the translation of the Open image in new window instruction). The instruction has been added because of the general definition of the Open image in new window translation rule; if the else block did not jump out of the loop, it would also make sense. Removal of such dead code, as well as other optimizations, are subject to subsequent post-processing steps and not within the scope of this paper. Since abstract execution is sound (Observation 1), the premise of (*) holds for all concrete contracts substituted for the abstract ones induced by the placeholders in the programs; this means that in particular, we can substitute \(p_j\)/\(p_ IR \) for \(p_j^ abs \)/\(p_ IR ^ abs \). Let Open image in new window , Open image in new window be the updates resulting from SE of the concrete programs (if SE splits, we can obtain summaries by state merging, see Appendix A).